In the Waiting Room | Feel the Music! When attending our observing one of our Kids Kicking Cancer workshops at Columbia, whether songwriti ng, singing, or calming cello to soothe the environment when it gets busy, it’s amazing to see how music changes the mood of everyone there. The waiting room can be a stressful place; as one grapples with administrative tasks, while worrying about a treatment for themselves or a loved one that may be forthcoming. Whatever age, or role, whether actively engaged in writing/singing or actively listening to soothing tones, the power of the music comes through. Infants, parents, staff, teenagers; they stop, take notice, put down their phones – they are changed. It is a beautiful example of humanity, and of connecting with one another. 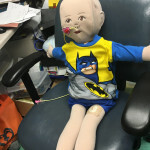 (pictured: a therapy doll used by the Child Life Specialists on staff). Today was great. There were a few kids at the beginning in the waiting area. One girl, whose 7th birthday is tomorrow, was making a pencil holder/purse out of fabric and a kind of fabric-tape. It turned out great! I asked if she wanted cello accompaniment by the art table and she said yes, so I played with her in the art corner for an hour or so. It’s so encouraging and gratifying when the staff passes by and let’s me know they enjoy the music. Even though I’m in the waiting area, the sound travels throughout the floor, and it’s a great reminder that even though there may only be a few people next to me, others can hear the music. After about an hour, a nurse asked if I would play in the treatment area. It was very busy with several children receiving treatment. The age range seem to be from about two years old to 18. As usual it was a diverse group. There was a five-ish year old girl from the Dominican Republic, a small African-American boy who might have been two years old, a preteen Hasidic girl and two older male teenagers, also Hasidic. After about twenty minutes, the young girl asked me if I knew something from the Nutcracker. I took out my phone, listened to the Dance Of The Sugar Plum Fairy and did my best solo cello rendition. She was delighted. It was a complete mood changer. It always ends with the best! I could have stayed another hour after that and just played for her so she could dance in her chair. It turns out that she loves ballet. I hope to see her again so we can play more music together. Again, I’m always blown away by the tremendous love and care I witness in the families, doctors and nurses at NY Presbyterian. This experience amazes me every time.